Howdy from Texas! I’m checking in sooner than anticipated to fill you all in on what our little family has been up to these past few weeks. It has certainly been an adventure! To be honest, this entire past month has been a bit surreal. 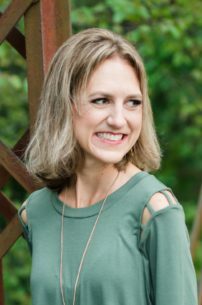 When we visited Austin at the start of February, we suspected that the move we had anticipated for so long would be imminent—and we were right! On that five-day trip, we found a great house to rent, and since the landlord would only hold the place for us for ten days, time was of the essence! The next couple of weeks flew by as we packed up our home and said goodbye to as many people as possible (though not nearly as many as we would have liked). 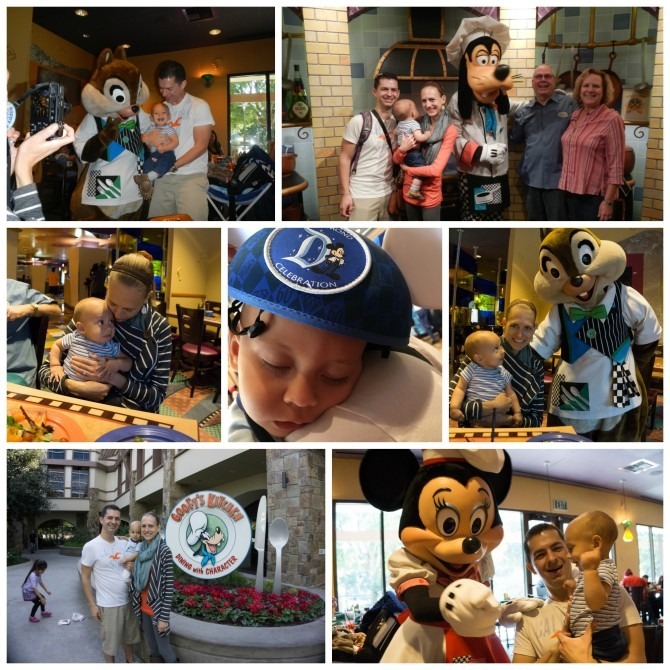 We had numerous “last time” experiences: most memorably, we took our final trip to Disneyland, which included Charlie’s FIRST ride on Pirates of the Caribbean (he loved it) as well as a character breakfast with my parents at Goofy’s kitchen. Charlie was NOT a happy camper at the start of our character breakfast: much to my surprise, he was terrified by the characters. Fortunately he warmed up by the end of the meal, though he was still VERY cautious whenever a character approached our table! Up until our last couple of days in California, I think I was in denial about the entire situation. I was so overwhelmed that I couldn’t bring myself to pack a single box, and poor Luke shouldered the brunt of all the initial packing (in addition to taking care of most of the moving logistics AND still working full time; he deserves an award for sure!). I finally overcame my temporary paralysis and started packing just three days before our movers were scheduled to arrive. 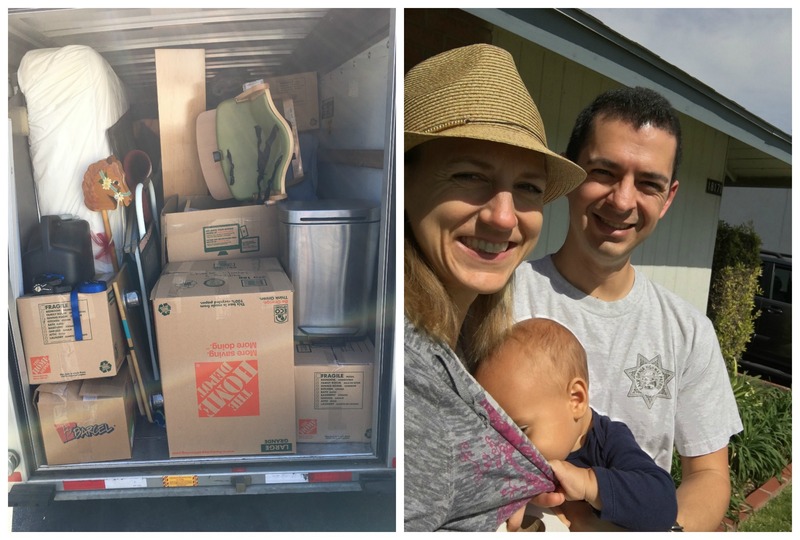 As we neared crunch time, family and friends generously offered to help us pack (and occupy Charlie while we packed), and everything was ready to go by the time our movers showed up on Thursday morning! He seemed a bit confused by our house’s sudden lack of furniture. Once the movers had cleared out our furniture and the bulk of our boxed items, we were left with our essentials (some clothes and dishes, computers, our mattress, etc. ), which we loaded into the small U-Haul trailer we would be taking with us. We had every intention of leaving bright and early Friday morning, but after a late night, we needed some rest, so we slept in a bit. A handful of last-minute details kept us from leaving until after noon. Isn’t that always the case? 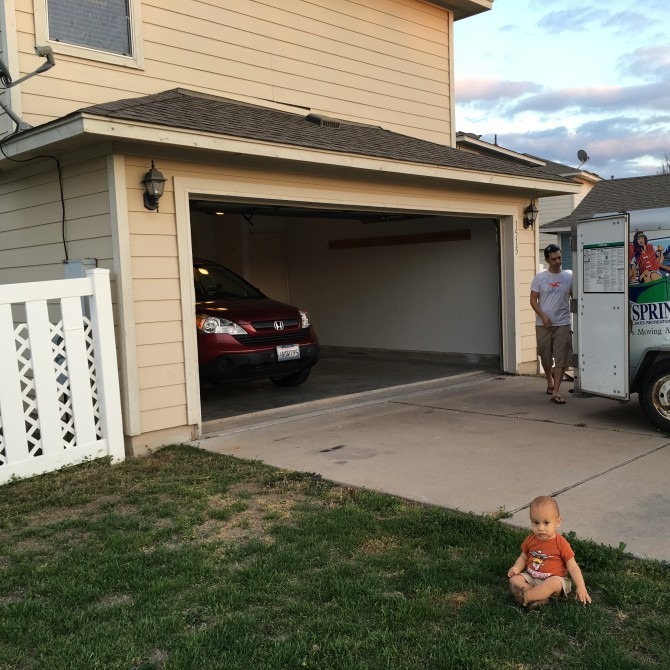 Van loaded and cars ready to go, we tried to get one more family picture in front of our home before we moved out; Charlie was more interested in eating than picture taking. 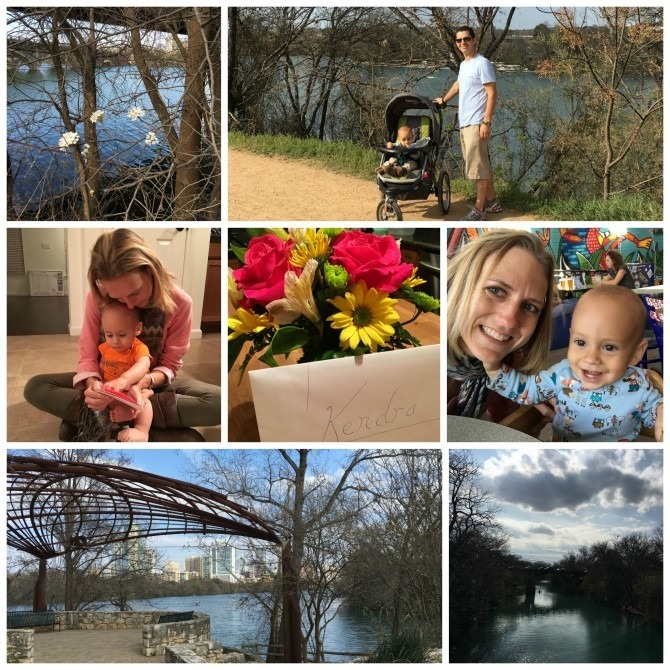 We had initially hoped to arrive in Austin on Saturday night, but our goal for a two-day drive proved overly ambitious: two cars, a one-year-old, and a trailer will slow anyone down, but I had not anticipated that the primary reason for our needing an extra day of travel would be ME! I had actually been looking forward to the long drive (plenty of time to catch up on podcasts and audiobooks! ), but I’ve never personally driven more than a couple of hours on my own, and I completely underestimated the fatigue that would accompany such a long drive. I spent our entire two days on the road STRUGGLING to stay awake! I blasted my air conditioning, sang along to the radio at the top of my lungs, and snacked on Twizzlers and coffee (a combination I would NOT recommend. . . on day two I switched to Jerky, a much more body-friendly snack!). I was terrified that I would fall asleep at the wheel, so we took frequent stops and ended up staying in hotels two nights in a row. Unlike his mama, Charlie, did amazingly well: he mostly rode in Luke’s car, and he alternated between sleeping and slight fussing until Luke discovered that hearing Daddy talk on the speaker phone kept Charlie happy. In his efforts to appease the little one, Luke asked Siri random questions and spent several hours on speaker phone with me (which also helped to keep me awake!). Road Trip! 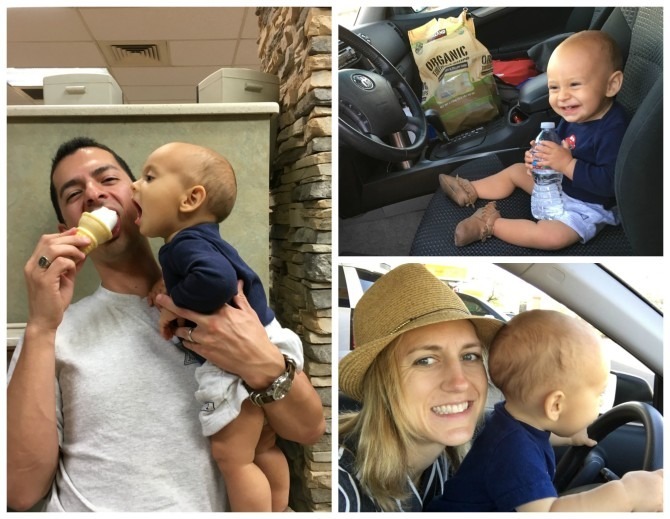 Charlie discovered a love for ice cream at one of our (many) pit stops. Despite my exhaustion, I managed to drive safely up until our very last rest stop when, just two hours from our final destination, I backed my car into a truck. Everyone was fine, but my back bumper will never be the same. Needless to say, we were more than a little relieved to arrive at our house Sunday evening. Home at last! Luke’s sister and a few of her friends met us at our house and helped us unload our cars and the trailer, then we all headed to a late dinner. We returned to our house an hour later to discover that we’d grabbed the wrong set of keys in our hurry to leave and were locked out of our house! We made a sheepish phone call to our landlord, who was sympathetic but let us know that he was out of state and had no way of helping us. . . so the three of us sat in our garage, waiting for a 24-hour locksmith to come to our rescue. Unfortunately, that wasn’t the last of the day’s mishaps: once inside, I opened up my backpack to discover that a partially opened bottle of soda had spilled all over my bag’s contents. My laptop survived; several journals didn’t. I burst into tears: our new life in Texas did not seem to be getting off to a good start. I was homesick and scared and not at all sure that we had made the right decision in leaving California. Finally home and ready to unload the moving van. Things looked much brighter in the morning—and they have only gotten better since! We’ve been here in Texas for over a week now, enough time to familiarize ourselves with the area. We are in love with our little town, which is situated about 20 miles outside of downtown Austin. 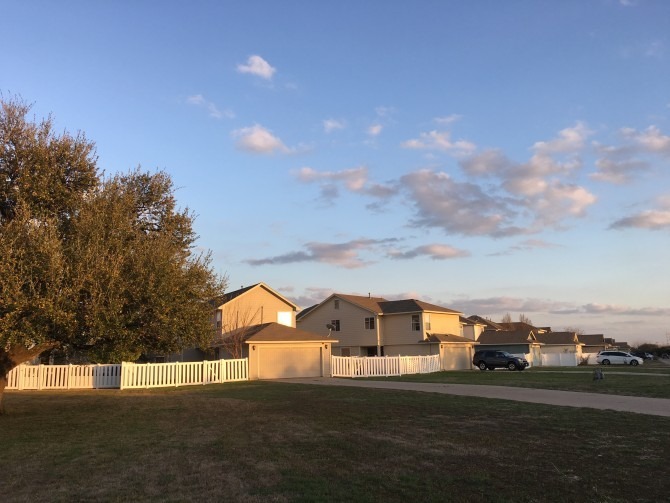 Our neighborhood feels rural but is also within walking distance of numerous stores and restaurants, and the area satisfies my craving for novelty, while being familiar enough to feel like home. We are also ecstatic about our house, which is far bigger and nicer than any place we’ve ever lived. 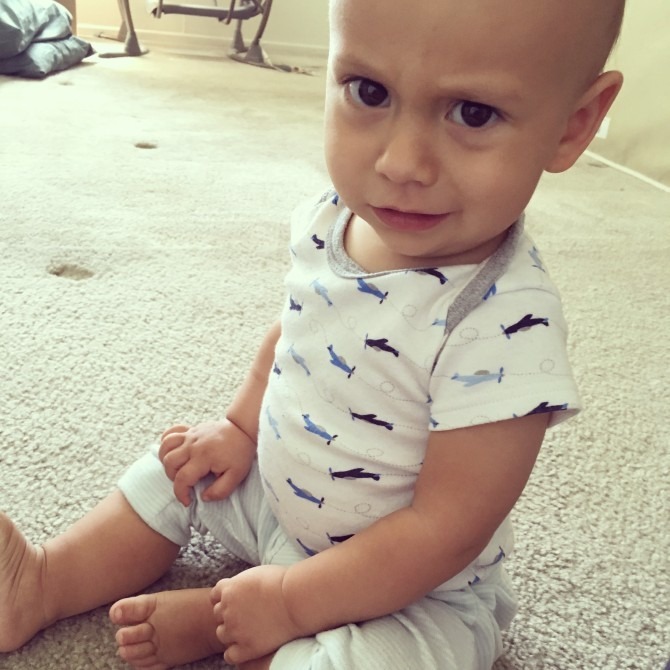 Luke has been working this past week, and we are navigating this new normal of having him work from home. (So far, so good!) Charlie and I have had a chance to scout out the nearby walking trails, locate all of our nearest stores, and even attend family story time at the local library. Last Tuesday was my birthday, and he was able to take a half day so that we could celebrate in the afternoon. We went to Wahoo’s for lunch (I can’t tell you how excited I was to find my favorite restaurant here in Austin! ), then we took a 4-mile walk along the Colorado River. I am amazed by the natural beauty that exists within the city itself, and I look forward to spending more time exploring the parks along the river. What a wonderful way to spend my first birthday in Texas. Celebrating my 32nd birthday, Austin style! Our furniture still hasn’t arrived. (Our moving company guarantees we will have our things within 30 days, but not necessarily any sooner.) I’d be lying if I said that I don’t miss having a couch to sit on, or that I’m not chomping at the bit to get our home situated. But we have what we need to get by right now, and I have to admit that there are perks to having an empty home: it’s nice that Charlie can roam without our having to worry about his getting into anything, and our current minimalist lifestyle is revealing how few of our possessions are truly necessary. I’m hoping that this inspires me to purge more of my belongings once they arrive! (I’m currently listening to Marie Kondo’s Spark Joy for further motivation in this area!) I’m sure that once our house is full, we will have many busy days of unpacking, decorating, and organizing. Until then, it’s been nice to have a bit of a reprieve from the business of tidying our things. 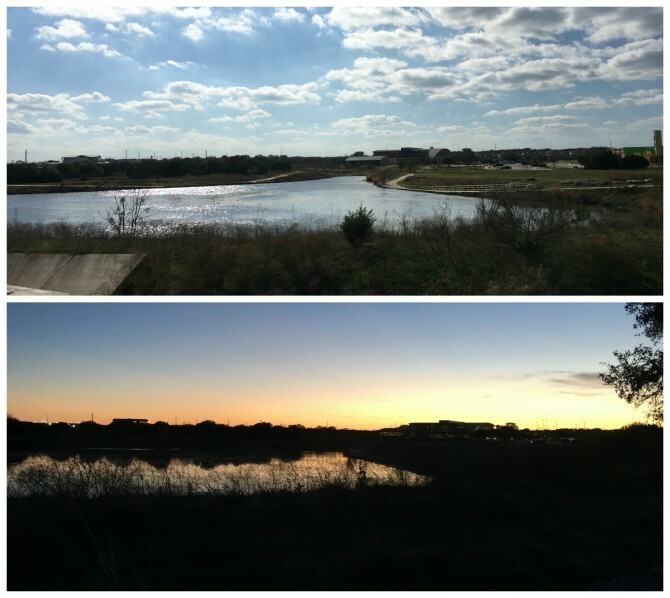 I love that our neighborhood backs up to this pretty lake and walking trails! As excited as I am to be here in Texas, I’m still waiting for the reality of our move to sink in. A huge part of me still feels like we are on a vacation (the fact that we are literally camping in our home doesn’t help. . .), and I have to continually remind myself that this is home now. I’m eager to get settled into our community, find a church, make new friends. For now I’m just taking things one day at a time, allowing my mind and my heart to adjust at their own pace. And on that note, I am heading back into blogging hibernation. Thanks for your prayers and your patience as I take some time to settle into Texas life! I will be back soon! 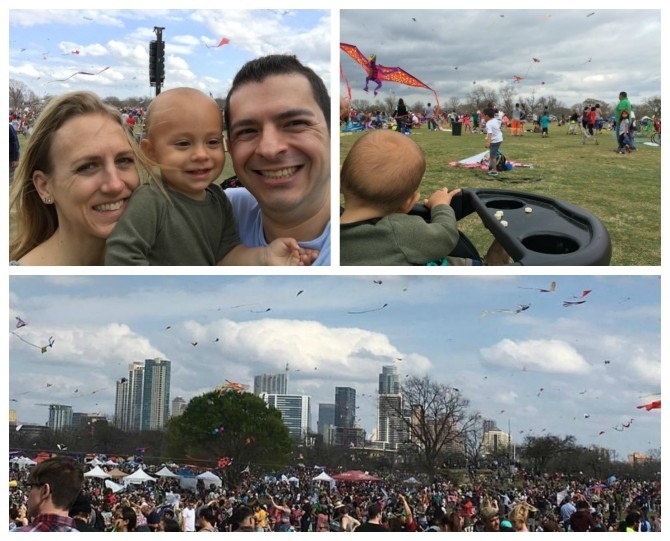 Scenes from the kite festival we attended downtown this past weekend. So much fun!